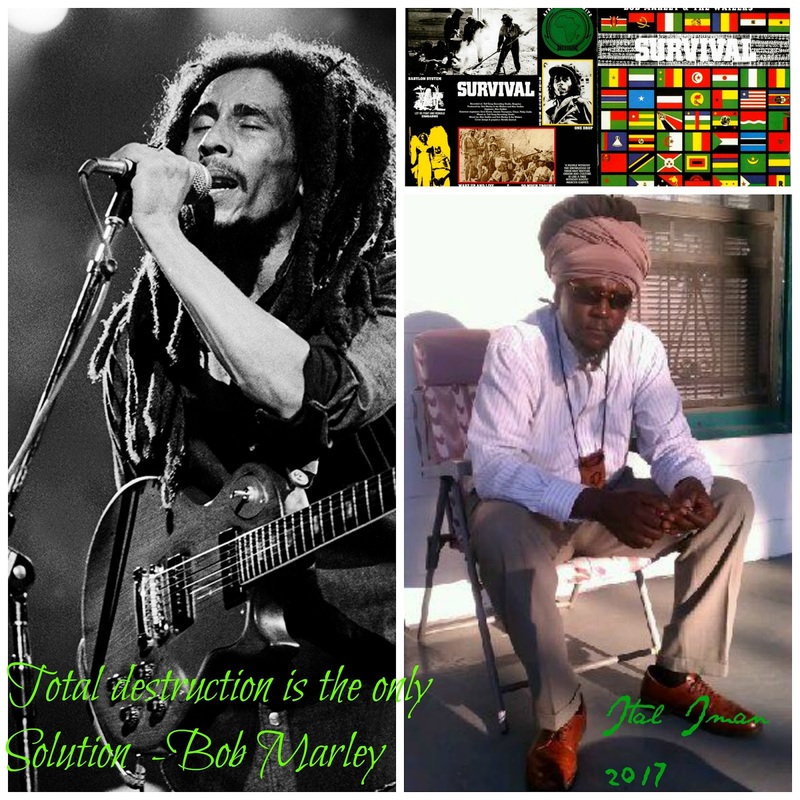 THE RASTAFARI MYSTERY SCHOOL: Bob Marley * The Dance of shiva * "Total destruction is the only solution "
Bob Marley * The Dance of shiva * "Total destruction is the only solution "
There were special chords used from ancient times of what today is called the solfeggio scale, David knew the chord to summon or invoke God and the angels into his situation. He won all his battles through the power of (Pe) pRaise. Allow the Holy Spirit to fine tune your inner Lyra that’s in your head, a part of your brain. Sing and prophesy yourself into your next level. The heavens of heavens are aligned in agreement with you. Just before you do that, you need join Lyra in the heavens with celebration and (Pe)-pRaise. You will need to turn your volume up, get and get some energy going as the fibers (strings) of your fornix vibrate. Do you believe that God is up to something good? Do you believe His plan is working out everything for your good? The sacred stone also frequently appears as a metaphor in the Bible. God himself is called the Rock (Deut 32:15-43); “for their rock [the god of the Canaanites] is not our rock [the God of Israel]” (Deut 32:31). God’s kingdom is a stone cut out of a mountain without hands (Dan 2:34). Both Jesus and Peter are called the Rock (Mt 16:18, 1 Cor 10:4), while Christ is the rejected cornerstone (Mt 21:24). The concept of the sacred stone thus survives as perhaps the most enduring metaphor of the holy. 1. Located in the center of the brain is an enigmatic little organ (relative to the other organs in the brain and the surrounding limbs of the body) known as the pineal gland that is the subject of remarkable new scientific investigation. Located in the center of the world is an enigmatic little rock (relative to the other rocks and mountains and the surrounding nations of the world) known as the Foundation Stone that is the subject of remarkable ancient Jewish traditions. 2. 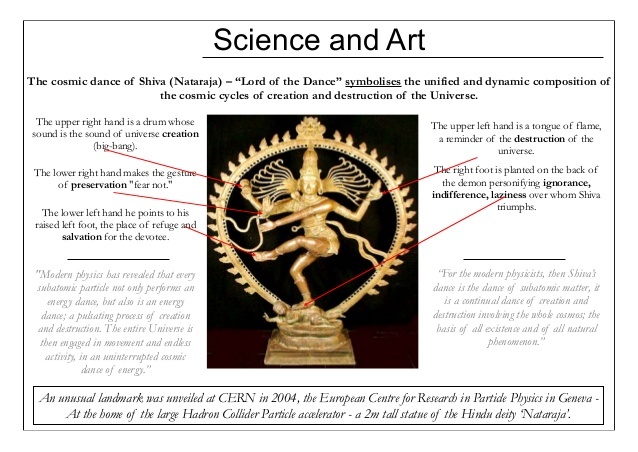 Historically, the pineal body has been associated both in the Orient and in the Occident with different functions of consciousness including being the seat of the human soul through which spirit enters and leaves. Historically, the Foundation Stone has been associated in the Bible, Talmud and kabbalistic traditions with different functions of global consciousness including being the “seat” of the world’s collective soul and through which the world’s spirit enters and leaves. 3. 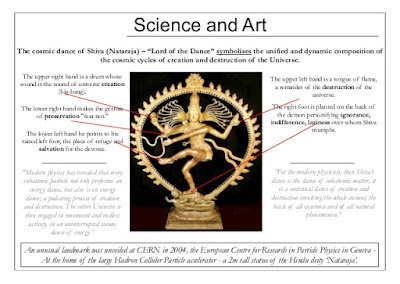 Until now, however, there has been no mechanistic model or physiological explanation as to how it functions and why the human body even needs a pineal gland centered in the brain, the consciousness center of the body. Until now, however, there has been no mechanistic model or metaphysical explanation as to how it actually functions and why the collective world body even needs a Foundation Stone centered in Jerusalem, the consciousness center of the world. 4. It is now theorized that the pineal gland is capable of generating a natural substance known as DMT (Dimethyltryptamine), an extraordinarily powerful essence that is able to alter one’s personal consciousness, transport a person’s mind into an inner metaphysical dimension and imprint one with a radical life-changing spiritual experience. It has long been known that the Foundation Stone is capable of generating a universal substance known as Mayim Chayim – “Living Liquid”, an extraordinarily powerful liquid-light essence that is able to alter our collective consciousness, transport humanity’s mind into an inner metaphysical dimension and imprint all of us with a world-changing Godly experience. the elongated ridges on the floor of each lateral ventricle of the brain, thought to be the center of emotion, memory, and the autonomic nervous system. The pineal gland or epiphysis synthesizes and secretes melatonin, a structurally simple hormone that communicates information about environmental lighting to various parts of the body. Ultimately, melatonin has the ability to entrain biological rhythms and has important effects on reproductive function of many animals. The light-transducing ability of the pineal gland has led some to call the pineal the "third eye". 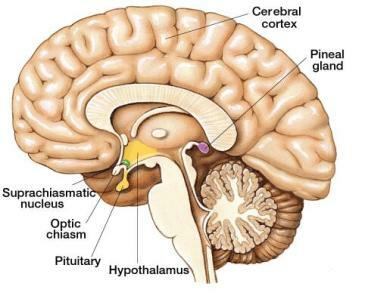 The pineal gland is a small organ shaped like a pine cone (hence its name). It is located on the midline, attached to the posterior end of the roof of the third ventricle in the brain. How does the retina transmit information about light-dark exposure to the pineal gland? Light exposure to the retina is first relayed to the suprachiasmatic nucleus of the hypothalamus, an area of the brain well known to coordinate biological clock signals. Fibers from the hypothalamus descend to the spinal cord and ultimately project to the superior cervical ganglia, from which post-ganglionic neurons ascend back to the pineal gland. Thus, the pineal is similar to the adrenal medulla in the sense that it transduces signals from the sympathetic nervous system into a hormonal signal.'" The God Amun or Ammon in ancient times was usually depicted as a ram with curved Jupiter Ammonhorns, a man with a ram's head, or a man with two upright plumes as a headpiece. The name cornu ammonis, Ammon's horn, or the hippocampus, is a major component in the brains of humans where we find the clues in the secret mysteries that lie deep within each one of us; that we too can access with our own horns in prayer, séance, meditation, psychedelics and paranormal "visions." All humans have Ammon's horn which is two hippocampi, one in each side of the brain and it is a part of the cerebral cortex, and in primates is located in the medial temporal lobe, underneath the cortical surface. It contains two main interlocking Ammons Hornparts: Ammon's horn and the gyrus. Ammon's Horn or the hippocampus that plays one of the most important roles in the consolidation of information from short-term memory to long-term memory and spatial navigation. The Latin Hippocampus is from Ancient Greek ἱππόκαμπος (hippokampos), from ἵππος (hippos, “horse”) and κάμπος (kampos, “sea monster”). When we damage our Ammon's Horn (hippocampus), we damage the Lord and we humans will often sink into severe depression. In addition, it will be difficult for us to form new memories and this will often also affect memories formed before the damage (retrograde amnesia). Hence, it will become impossible for you to know thyself or evolve your soul without memory of who you are or were in past lives. Ammon's horn had special significance to our ancestors. In Egyptian mythology, the head and the horn of the ram were symbolic of activity and creative energy. This was signified in God's under such names as Amun-Ba or Ra and Jupiter Ammon. Jupiter equated with the Egyptian deity Amun after the Roman conquest of Egypt. The god Jupiter could assume the form of a ram, in which guise his name was Jupiter-Ammon. Jupiter is the Father of the day and as mentioned above, Ammon is "The Lord of Thrones and "The Hidden One." Many ancient images depict Jupiter Ammon under the figure of a ram, or on medals and coins he appears in human shape with ram-horns growing out beneath his ears. Could it be that they were sending us a message with these images and that the Ammon's Horn or (hippocampus) is one of the most important areas of our brains in our evolution and reincarnation helping us recall past lives? My intuition tells me, YES, without a doubt this is exactly what they were doing and now I will help prove this ancient fact to my brothers and sisters out there who care about such secret teachings. n. A stringed instrument of the harp family having two curved arms connected at the upper end by a crossbar, used to accompany a singer or reciter of poetry, especially in ancient Greece. n. A stringed musical instrument. n. A stringed instrument of music; a kind of harp much used by the ancients, as an accompaniment to poetry. n. One of the constellations; Lyra. See Lyra. In pianoforte-making, the lyre-shaped frame to which the pedals are attached and through which the pedal-rods work. The posterior portion of the under surface of the fornix of the brain, marked by a number of lines bearing a fancied resemblance to a lyre. 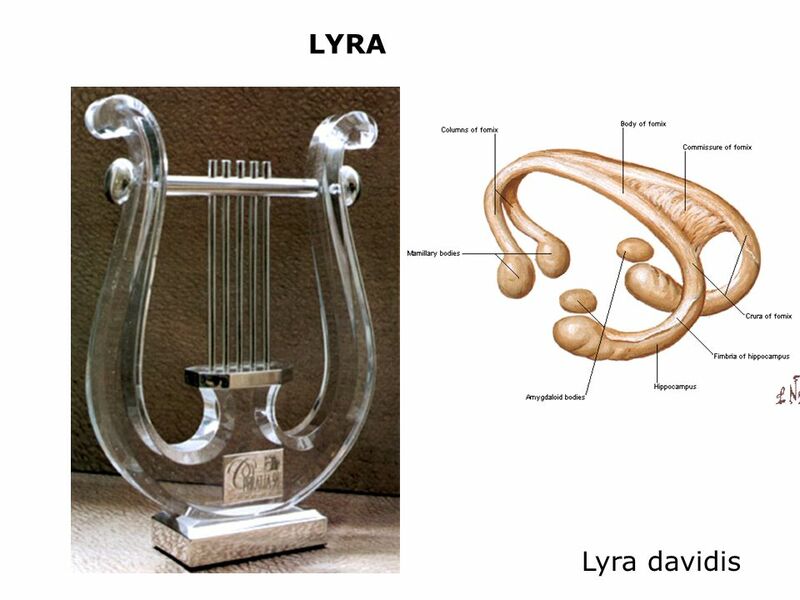 Also called lyre of David or lyra Davidis. n. A stringed instrument of Egyptian origin, which became the national instrument of ancient Greece. n. An element in the name of some instruments of the viol class, as the arm-lyre or lira da braccio, and the knee-lyre or lira da gamba. See lira. n. A kind of metallic harmonica, mounted on a lyre-shaped frame, occasionally used in military music. n. A kind of rebec used by the modern Greeks. See rebec. n. [capitalized] A constellation. See Lyra, 1.
n. A verse of the kind commonly used in lyric poetry. n. The Manx shearwater, Puffinus anglorum. n. A grade of isinglass: a trade-name. n. An obsolete form of leer. The fornix (Latin: arch) is a C-shaped bundle of nerve fibers in the brain that acts as the major output tract of the hippocampus. The fornix also carries some afferent fibres to the hippocampus from structures in the diencephalon and basal forebrain. 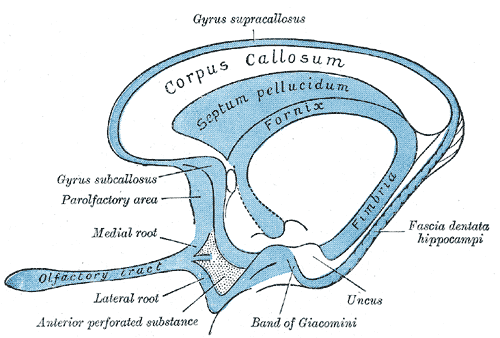 The fornix is part of the limbic system. While its exact function and importance in the physiology of the brain is still not entirely clear, it has been demonstrated in humans that surgical transection – the cutting of the fornix along its body – can cause memory loss. There is some debate over what type of memory is affected by this damage, but it has been found to most closely correlate with recall memory rather than recognition memory. This means that damage to the fornix can cause difficulty in recalling long-term information such as details of past events, but it has little effect on the ability to recognize objects or familiar situations. The lateral portions of the body of the fornix are joined by a thin triangular lamina, named the psalterium (lyra). This lamina contains some transverse fibers that connect the two hippocampi across the middle line and constitute the commissure of fornix (also called the hippocampal commissure). The columns (anterior pillars; fornicolumns) of the fornix arch downward in front of the interventricular foramina and behind the anterior commissure, and each descends through the grey matter in the lateral wall of the third ventricle to the base of the brain, where it ends in the mamillary bodies. (The following is an excerpt from The Jerusalem Stone of Consciousness – DMT, Kabbalah & the Pineal Gland). There is consciousness and medical knowledge now coming forth about a mysterious little organ in the middle of the brain known as the pineal gland and DMT, an enigmatic substance produced within the human body. The light they shed upon perhaps Judaism’s greatest secret and gift to the world – the Foundation Stone – is truly revelatory and profoundly timely.